The popular online cosmetics store brings out bold new nail polish colors for winter 2013-2014. ...we’ve made it so that our clients can change their look as often as they want, without spending more than is reasonable for high quality nail polish." Lady de Cosmetic, one of the nation’s largest online makeup retailers, is expanding its selection of nail polish by introducing L.A. Colors Color Craze Winter Nail Polish. This long wearing and chip-resistant nail polish is now available in 17 new colors in time for the fall and winter trends of 2013. Touting colors with names like “Shock” and “Edgy,” the new line offered by Lady de Cosmetic is available in bold shades of purple, turquoise, hot pink, and orange. The new colors join dozens of other L.A. 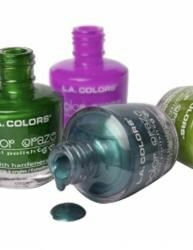 Colors nail polishes offered by Lady de Cosmetic, including L.A. Color Craze Glitter Nail Polish and L.A. Color Craze Sparkly Nail Polish. According to Daniel D., general manager of Lady de Cosmetic, the new nail polish options are the result of the online retailer’s growing client list, who are looking for variety in color options but don’t want to spend a fortune to build their personal inventory. “At these prices, we’ve made it so that our clients can change their look as often as they want, without spending more than is reasonable for high quality nail polish,” Mr. D. says. The company’s explosive growth over the past year is directly responsible for the savings passed onto the consumer. “We are so honored to be able to offer cutting-edge color options to those who dare to be different. Personal style is inherently a personal choice, and we’re just glad to be the vehicle to provide those options,” Mr. D. says. To that end, Lady de Cosmetic has plans to add to its inventory of makeup options, bringing in additional nail polish colors, eye shadows, eyeliners, lip liners, lipsticks and new, complete and mini makeup kits. Our goal has always been to help our clients to achieve their desired cosmetic look, on a shoestring budget,” says Mr. D.